We’ve all been there, the moment when you’re leaving somewhere, turn your car on and hear that awful clicking noise. After waiting a few minutes, you try again, but still nothing. Your battery’s dead. What do you next? This was the case for a Publix customer at Store #0656 in Columbia, South Carolina. It was a Sunday afternoon and Grocery Manager Eric Pittman was helping the Customer Service team during a busy lunch rush. A customer came in with her groceries bagged in hand and approached Eric about her car not starting. She asked if anyone in the store had jumper cables to help get her car started. Despite it being 100 degrees outside, Eric was quick to lend a helping hand. 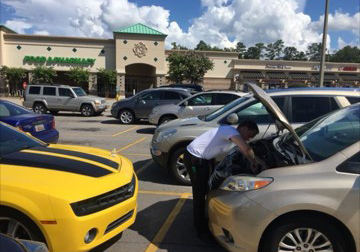 Eric placed the customer’s groceries in a cooler for safe storing before working on the car. He told the customer to wait inside the store so she could grab a drink and cool off while he went outside to jump the car. Eric determined her battery was completely dead and would need to be replaced. He came inside and let the customer know. She was distraught and explained that she did not have the funds to purchase the battery and her husband was currently out of town for business. Eric told the customer he would drive her to the store and not only get her a new battery, but also pay for it out of his own pocket. The customer was beyond shocked and felt very grateful for his dedication to help her. Eric purchased and replaced the battery. She called the Store Manager to reiterate how amazing Eric’s selfless actions were and that this was the reason she continues to shop with Publix. We couldn’t have said it any better than that. Eric received the Mr. George Gold Coin Award for providing premier customer service and going above and beyond his normal duties. Have you ever witnessed an associate going above and beyond at your local Publix? Share your story with us on Facebook, Twitter, via our Contact Us page or give our Customer Care team a call at (800) 242-1227. To read the stories of other recipients of the Mr. George Gold Coin, check them out here.